Bring classic style into your home with this beautiful wall clock. The piece carries an Oak Yorkshire finish on select hardwoods and veneers and features a flared, molded bonnet and fully molded base. The off-white dial features Arabic numerals and floral-patterned corner accents while a spun brass pendulum bob appears behind the front-opening glass door, which features a polished brass door pull. In addition, the key-wound, Westminster chime movement comes with a chime silence option as well as durable bronze bushings. You'll be set with this charming clock hung on your home wall. 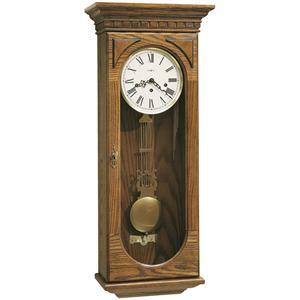 The 613 Sandringham Wall Clock by Howard Miller at VanDrie Home Furnishings in the Cadillac, Traverse City, Big Rapids, Houghton Lake and Northern Michigan area. Product availability may vary. Contact us for the most current availability on this product. Pendulum Description Brass pendulum bob. Chime Description Westminster chime movement comes with a chime silence option as well as durable bronze bushings. Wood & Finish Oak Yorkshire finish on select hardwoods and veneers. Case Detail Flared, molded bonnet and fully molded base. 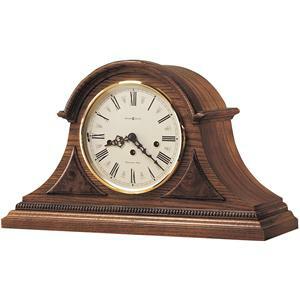 Accent your home in timeless, traditional style with the addition of the handsome 613 clock collection. Each piece embodies uniqueness and well-crafted design and comes in a variety of finishes as well as types, including wall, table, mantel and alarm. With key-wound chimes, Roman and Arabic numeral dials and quartz movement, the 613 series provides plenty of options for your home decor. Add the perfect touch to your living room or office with help from these rich and refined clocks. The 613 collection is a great option if you are looking for furniture in the Cadillac, Traverse City, Big Rapids, Houghton Lake and Northern Michigan area. Browse other items in the 613 collection from VanDrie Home Furnishings in the Cadillac, Traverse City, Big Rapids, Houghton Lake and Northern Michigan area.